It’s fun to change your photographic point of view every once in a while, especially if that opportunity is available to you. Fortunately, we live in an area with fairly tall buildings, so all we need to do is to get to the roof. The world sure is different from up there! I took my own advice a couple of days ago, spurred on by the chance to try out a new camera: the SP-560UZ from Olympus, the most powerful ultra-zoom digital camera they make. It’s got a monster 18x zoom, the equivalent of 27-486mm focal range. I’m currently reviewing it, and should be able to publish my findings sometime in the 1st or 2nd week of February, perhaps sooner. So far, I like the camera a lot. This is one photo that perhaps best exemplifies the camera’s powerful zoom. 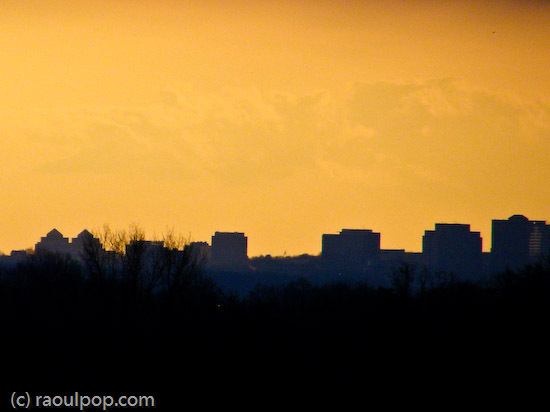 That Bethesda skyline is 5-7 miles away. With the naked eye, you can barely see those buildings, tiny as fleas, somewhere on the horizon. But the SP-560UZ bring them that close, and with its built-in image stabilization, lets me get a photo like this one while shooting handheld at maximum focal range. In another part of Bethesda, you can see this next building. I never noticed it was crooked before, but then again, I could never get this close to it before. I tried rotating the image to see if my horizon line was at fault — the cloud line was also crooked – but that wasn’t the case. When I line up the photo with the ground line horizontally, and with the trees vertically, the building clearly appears to be leaning to the right. I wonder if its owner knows of this. 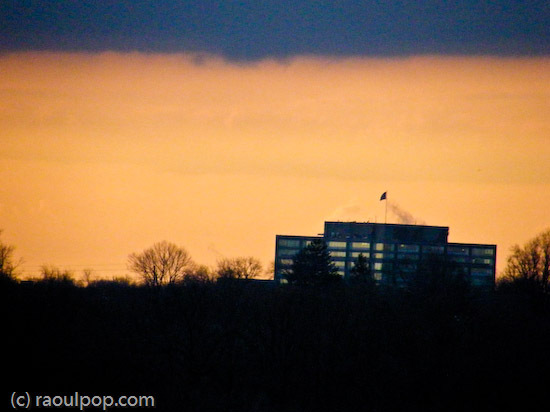 This is another photo I couldn’t get before: buildings near Montgomery Mall were always too far away for my reach. 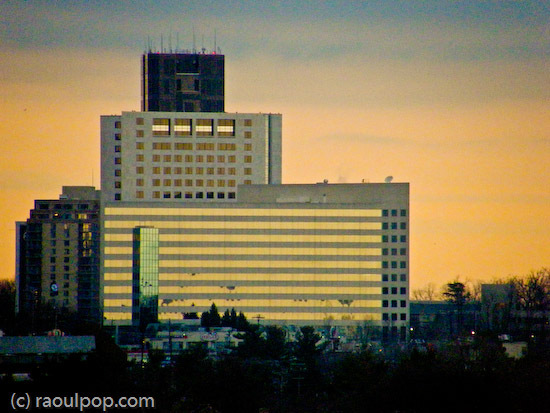 Then I turned and looked toward Bethesda proper, which can always be recognized by the National Naval Medical Center tower. The National Institutes of Health are across the street from it, but they’re not tall enough to show above the tree line. 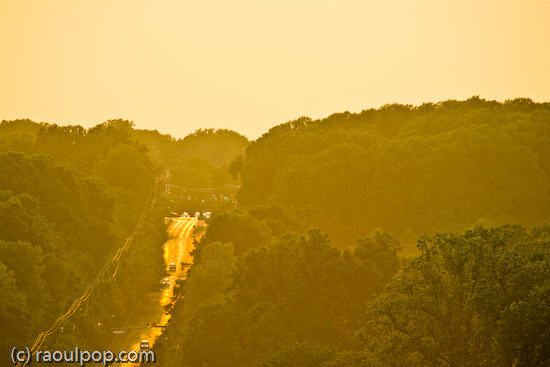 Here’s Wisconsin Avenue as it passes over I-495 and I-270. Here’s one of my favorite scenes. 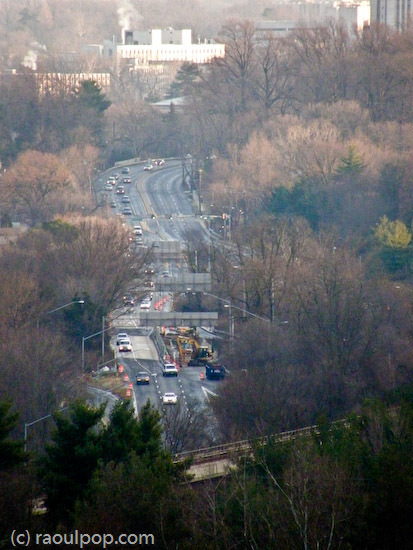 The photo shows NNMC, Wisconsin Avenue, the I-270 and I-495 overpasses, and the Metro Red Line, all at once. And to top it off, you can see the Metro itself rounding the corner as it climbs up from underground. That area is one of the most visually complicated transportation hubs I have ever seen. You’ve got two major interstate roads coming together in the valley below, Wisconsin Avenue bridging the gaps over the interstates (with the requisite exits onto each highway, of course), and above, the metro line, on an overpass bridge that comes up, out of the ground somewhere in the middle of the photo. And then you’ve got Tuckerman Lane and Grosvenor Lane, plus a bunch of other roads, spilling onto Wisconsin Avenue as well. It’s one big traffic spaghetti bowl, that’s what it is. 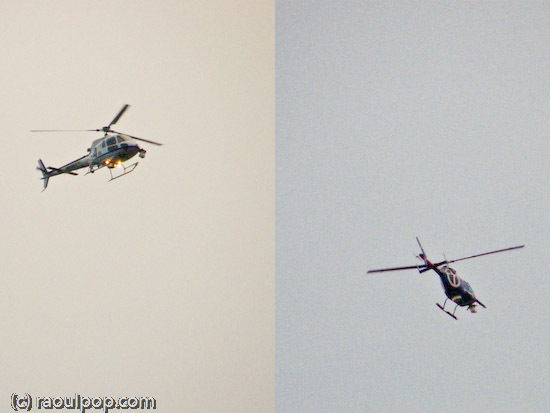 While Ligia and I were up there, two news helicopters from Channel 4 and Channel 7 flew rapidly overhead, then hovered above over I-495 at some distance away. Looks like there was some sort of accident there, but we couldn’t see anything because of the tree cover. 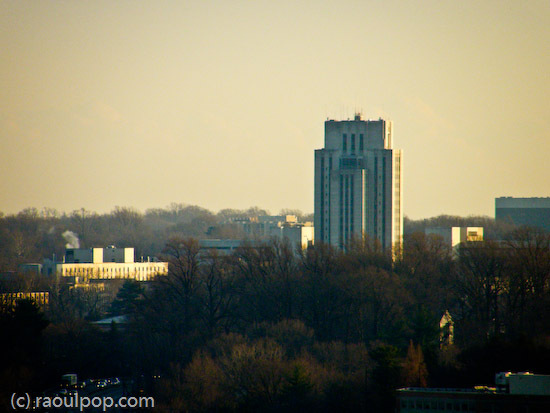 The North Bethesda and Rockville skyline was something I’d always wanted to catch with a good tele lens as well. The SP-560UZ made it possible. 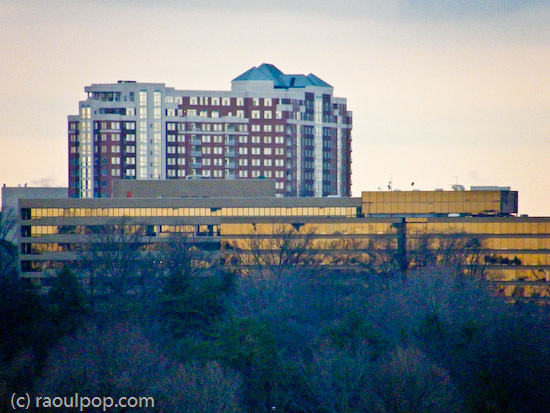 These are the buildings near the White Flint metro station. I love the architecture of those buildings, and must make time to photograph them up close at some point. 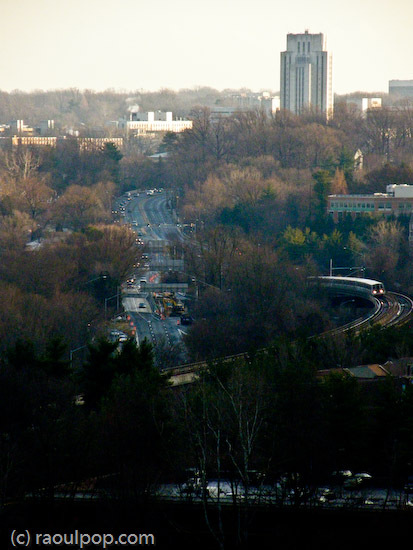 This is another view of North Bethesda that extends into Rockville. 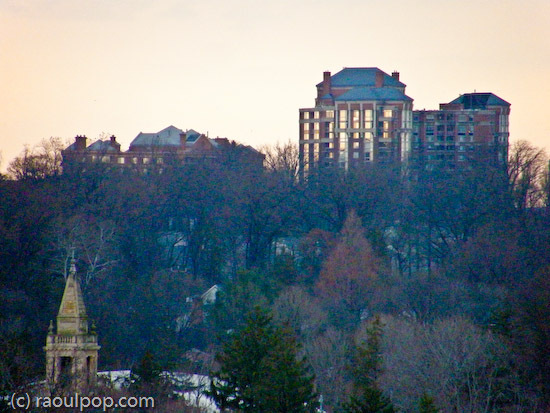 The tower in the lower left foreground belongs to Georgetown Preparatory School, which has been in existence at the same location since 1789. 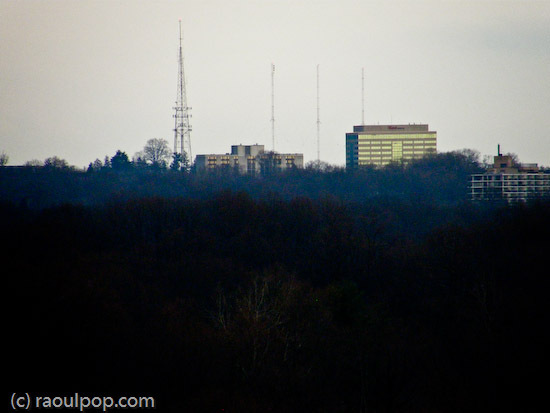 This is another view of the North Bethesda skyline. That big building that fills the background is a huge condominium building, and the one with the golden windows is an office building. Every time I see those golden windows (and I’ve been seeing them for some time) I keep promising myself that I’ll get up close to photograph them, but it never happens. Perhaps I’ll manage to make time this year. 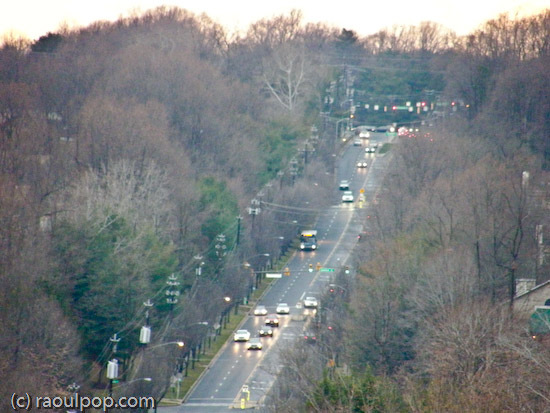 Finally, the road shown below is Tuckerman Lane, a major street that connects Rockville Pike to Old Georgetown Road and I-270 and I-495, at dusk. You may or may not remember Tuckerman Lane from this photo I took last July. This last photo was taken with the EF 100-400mm IS L series zoom from Canon, but to be fair, photos look a LOT better when it’s summer and you get that beautiful dusk light filling the scene than on a dreary, snow-less winter evening. Don’t judge the SP-560UZ harshly — its lens is very good given its price and intended market segment. By the way, this is my Week 2 post of the 2008 Community Challenge. Here’s Week 1. Great series of images, Raoul. 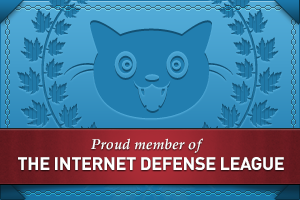 This is a wonderful submission to the 2008 Challenge.